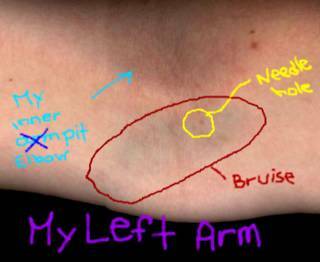 This is my left arm, which I scanned (using my scanner/printer) and have labeled so that the bruise on my arm is very easily identified. I think the whole thing is a work of art, its beauty makes me want to cry. 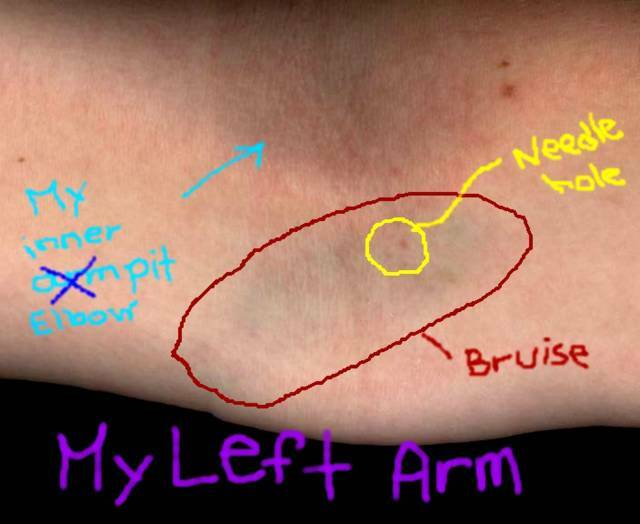 It speaks to me in ways that nothing ever has, whispering, "Life is confusing (read: the reason why I get such a big bruise after I have blood taken is confusing), and not easily classified or categorized (hence my problem with the whole 'inner armpit or inner elbow' confusion). But it is full of colour, and people (eg. me) who have too much time on their hands." You're very creative Megan. Unlike you, I never did bruise went getting needle work done. I hated it because I never got the sympathy. geez, for a minute there i thought you'd turned into a junkie since i last dropped by here! phew!